I have been juicing regularly for 3 years and whenever people see me after a long time, they tell me how well I look. They comment not only on the weight loss and the fact that I’ve kept it off, but on my skin and general all-round brightness and positivity. 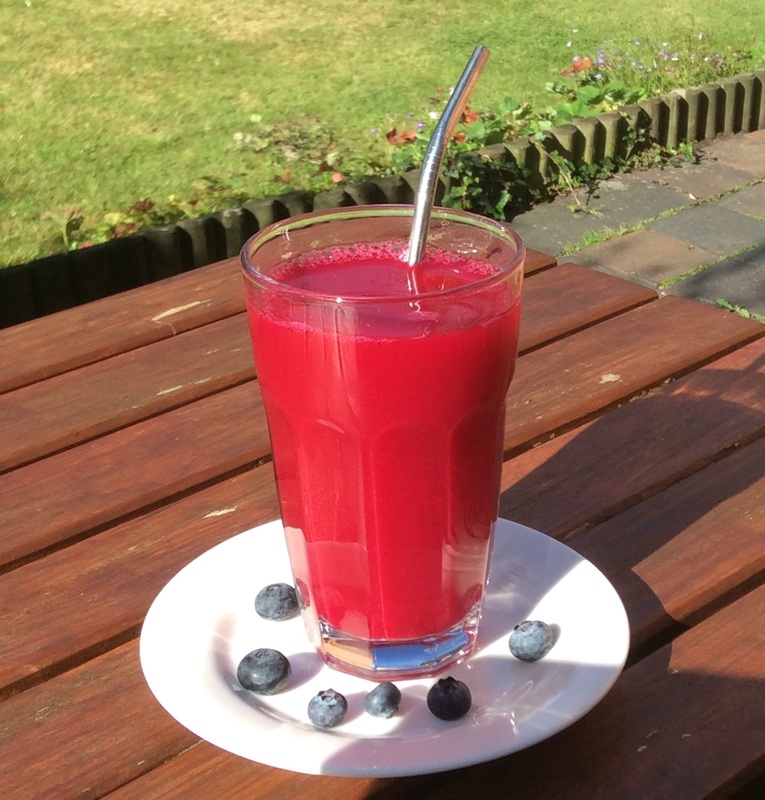 Many become interested in having a go at juicing themselves, but often feel overwhelmed and intimidated by the range of juicers available – and the cost. In the past, juicers were clunky, complicated and required a lot of cleaning – and they didn’t go in the dishwasher! Fruit and veggies had to be chopped up and and it was all terribly time-consuming. The cheap one I had when I first tried juicing years ago was hard work and couldn’t cope with pips etc. So, it was consigned to the back of a cupboard and later donated to a charity shop. Nowadays, there are juicers with wide chutes so that you can fit a whole apple in. They cope with pips, peel and larger portions. Some are a lot quieter too! (Tip: It is always an idea to ask a regular juicer what they are using and if there are any to avoid). In Jason Vale’s early videos, he uses a Philips 1861 and so at the time did my nephew who was working on Jason’s SuperJuiceMe! documentary. * He sent me a link and I ordered it. Everyone I know who has ever had this model has liked using it – including Hanna Sillitoe at BeyondFitUk* and Mark Beddoe of Explore Juice. * (see Mark’s photo below with Philips 1861). It is a great centrifugal – fast – juicer and everyone is mystified as to why Philips stopped selling it. It is a real workhorse and lasts years. It has a larger capacity than many centrifugal juicers so you don’t have to empty it as often. It has a wide chute. But it is a bit noisy. I only stopped using it because I wanted to step up, it is still in use (I gave it to my daughter), and my son has one too. I sometimes see them on ebay or Amazon secondhand and you can still buy spare parts on ebay. (Tip for using the Philips 1861: place a small glass under the spout as soon as you remove the juice jug so it doesn’t carry on dripping onto your work surface). After a few months of juicing, I knew I was in it for the long haul so I stepped up a bit and bought Jason Vale’s new Fusion juicer. It is a bit more powerful and the pulp is a bit drier than with the Philips. We found this easy to use, it has a wide chute too but it didn’t take as much effort to push down the veg. With the Philips, you fill the chute and then push it through, with the Fusion you put them in one at a time. You get into a rhythm and it is quick and easy. We also found it a little easier to dismantle. We loved the non-drip articulated spout which was a refreshing addition after the drippy Philips! The cord comes from the middle of the back so there isn’t a problem siting it in relation to sockets. 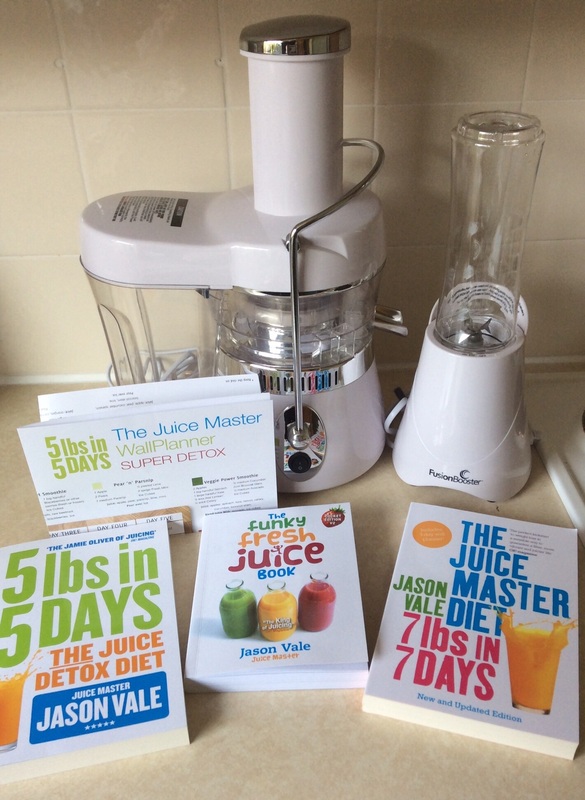 It is sold on the Juicemaster website* (as I write it includes a recipe book and the SuperJuiceMe dvd). We used it for a year and it is still in good working order, it is mothballed at the moment waiting for someone to try it out or as a back-up in case – fingers crossed – my current one faints from overuse! (Tip for using the Fusion: It has a useful handle so that you can tip up the juicer to drain the remainder of the juice, less waste). Earlier this year I was very kindly given some money and told to spend it on myself. Right, I thought, time to hit the big time! I had long wanted to progress to a masticating juicer but they are very expensive. They produce more, better quality juice that keeps longer in the fridge. The pulp is practically dry. In the long run, you get more juice for your money. And they are quieter! Sometimes I’ve felt like I should be wearing industrial ear defenders! Neil Martin, the Natural Juice Junkie* and my Twitter friend Mark Beddoe of Explore Juice* favoured the Optimum 400 and more recently the Optimum 600 sold by http://www.froothie.co.uk. These have all the bells and whistles as they also make nut milks. They even manage pineapple with the skin on! Everyone I know who has one of these thinks they are the bee’s knees! They produce excellent quality juice. On their recommendation, I ordered one and was very excited about the prospect of becoming a serious juicer and joining the big boys. Unfortunately, it turned out to be too heavy, we couldn’t move it. This is a big problem with slow juicers. If you have a weak back or you are elderly or frail, they can be on the heavy side. It was also too tall to sit on the counter under my top cupboards, so it would have to be stored in a cupboard and brought out every time we needed it. (Tip: A juicer that is stored away will rarely, if ever get used. It needs to be in position, ready for use or you will get tired of having to set it up and it will just gather dust). My other problem with the Optimum is that the cord was on the wrong side to fit in my sockets and it was too short to reach. So, sadly, I had to send it back. However, it is a reliable brand and Froothie have excellent and responsive customer service. (Unable to find the dimensions and weight of their blenders on the website, I received a call from Bernard who took on board my suggestions and promptly added this and other info to the specs on the site). The Optimum 600 has a 10 year warranty on the motor and 2 years on the parts. (I did choose one of their blenders and I am very pleased with it. More on that in a later post). Eventually, I was seduced by Jason Vale’s latest model, the Retro Cold Press masticating juicer. Not only does it look good and come in several colours – including Union Jack! – it does the job easily and relatively quietly. My version doesn’t do nut milks, it is solely a juicer – I got it on special offer and it didn’t have that accessory, but other full-price Retros do. They also make sorbets. It is easier to manoeuvre and the veggies easily go down the wide chute. It produces great quality juice and dry pulp. In fact, we used to use a compostable bag to collect the pulp with the other juicers, but this pulp is so dry you just tip it straight into the compost bin and there’s hardly a trace of it left in the jug! Some people have problems with celery, but we find if we cut it up and feed it through near the end with other veggies it is fine. This has a non-drip spout too. It has a massive 25 year warranty on the motor and 5 years on the parts. (Tip: If you pour a glass of water through the juicer at the end you will get more juice and less waste). And finally: Joe Cross*, aka Joe the Juicer of Fat, Sick and Nearly Dead fame, always uses a Breville juicer in his films and videos. It has a wide chute and juices quickly and efficiently. It is a reliable brand and although I have never used one of their juicers, I have a Breville Blend-Active blender which is excellent. (Tip: Clean up as you go! It keeps your working space clear if you wash and prepare all your fruit and veg, clear away the debris, juice them and then rinse out your juicer straightaway. It is much easier and quicker to clean it out immediately before you have your juice and it is also more hygienic, less risk of bacteria developing). UPDATE: Retro have just brought out their new Retro Super Fast Juicer, a centrifugal juicer, which really looks the business, matching both the Retro Cold Press Juicer and the Retro Super Blend, both of which we own and use on a daily basis. I think my husband would leave home if I suggest buying another juicer (we have 3! ), so I can’t comment in detail, but the thing I like immediately is that it is ambidextrous. Some juicers have the plug on one side which means you can only use them in a certain position on the counter and in my case this was an issue because of the position of the sockets in our kitchen. I also like the large pulp container, meaning you can juice continuously. Jason Vale recently did a comparative juice-off with the favoured old stalwart, the Philips 1861 and found that the new Super Fast Juicer produced slightly more juice. The Retro Super Fast Juicer is now available from Retro and Juicemaster. UPDATE TO THE UPDATE! 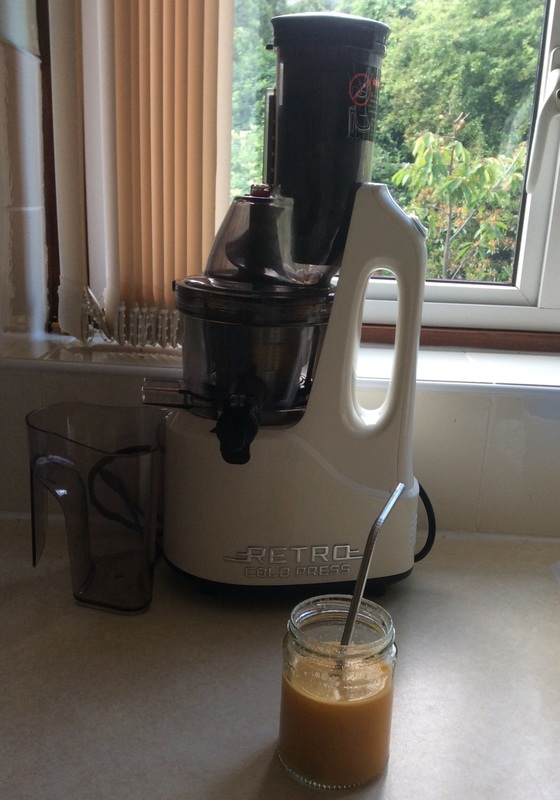 I did buy the Retro Super Fast Juicer (of course I did!) and I think it’s great. It is easy to assemble and take apart, very easy to clean and use. It is light and clean-looking. One word of warning: you can’t put a glass of water through this at the end to push the remainder of the juice through, it will flood your counter, but you can tip it up when it’s switched off to drain it. I would recommend this model for anyone new to juicing. There is a saying amongst regular juicers: the most expensive juicer is the one you don’t use. My advice is to make a mental commitment to juicing, get the one you can best afford and look on it as an investment in your health: think of all the potential prescription charges you might save! As you become more adept and more interested in juicing for health, you will probably want to move up the scale from a centrifugal – or fast – juicer to a slower but more nutritionally efficient masticating juicer. In the end though, as The Juice Junkie says: Any juicer is better than no juicer! I hope this has helped you sort the wood from the trees and good luck! PS Nutribullets are not juicers. Posted on November 23, 2015 January 2, 2017 by thejuicenutPosted in Juicers, JuicingTagged Froothie, Fusion juicer, Jason Vale, Joe Cross, juicemaster, Juicers, juicing tips, Natural Juice Junkie, Optimum, Philips 1861, Retro Juicer.